Plant and facility managers, engineers, architects, designers, and even some home improvement enthusiasts know full well the critical importance of proper measurements. Across projects in almost every industry, the accuracy of measurements can determine the success or failure of the entire endeavor. At times, operators and designers need to revisit a project because a measurement error is caught at the production stage. These are the lucky cases, when the problem can be addressed, corrected, and the process can be put back on track. The best case, however, is to have as many measurements carried out as correctly as possible at the onset of a project. Calipers are devices used to accurately measure distances between two sides of an object. They’ve come a long way from their early resemblance to a compass with inward or outward-facing points. These early “compasses” had their tips adjusted to fit across the length of the object, and then reading the measurement. Calipers are essential tools for a wide variety of projects and applications, especially in construction and design. Not all calipers, however, are made the same. Varieties of calipers include inside and outside calipers, divider calipers, oddleg calipers, Vernier, and dial calipers. Each of these provide different kinds of readings to various degrees of accuracy. Digital calipers can be the best option for a variety of applications. These are shaped similarly to Vernier calipers, but with the addition of an electronic digital display. This display provides an accurate reading immediately. Digital calipers can provide worry-free operation at the beginning of a project, especially at the design stage. Using these calipers allow you to avoid calculation mistakes further down the line and ensure that your final product has the high quality and reliability that your customers expect. This is why Emerson is happy to provide a FREE digital caliper with orders of $250 or more. We understand the mission critical role bearings can play in your processes. 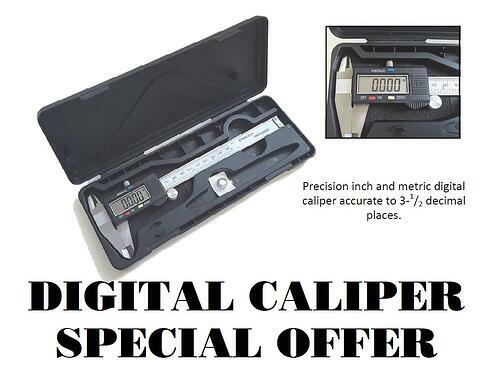 In order to help you get even more out of your bearings, we are glad to offer these free digital calipers. Consider it a “thank you” for buying your ball bearings from us. The offer is only available for a limited time, expiring on December 31, 2015. Contact us today to find out how to get your free digital caliper.